Above is an interesting chart that has been making the rounds on the internet. Oddly I have yet to find the original article that was the source from Haver Analytics an independent research arm of Morgan Stanley (MS-NYSE). Normally when articles talk about debt to GDP the reference is government debt to GDP. Overlooked is adding up all debt and seeing what that ratio is. The results were rather startling. That the western economies are overburdened with debt is not news. Long before the financial crisis of 2008 there were numerous warnings of an impending debt collapse. The warnings were largely ignored. Since then little has changed. The banks were bailed out and the financial institutions went back to business as usual fighting off all attempts to re-regulate the market and paying themselves huge bonuses. 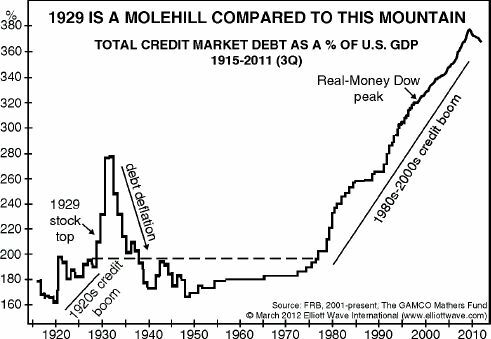 Not included in this chart is the $700 trillion (some say it is as high as $1.2 quadrillion) of derivatives outstanding. ***What is startling in looking at the chart is that government debt is not necessarily the largest component. The largest component for most of them is financial sector debt. And the one that has the largest exposure to the financial sector is Britain aka the United Kingdom. *** Altogether the UK’s total debt ratio to GDP is an astounding 950%. This dwarfs the Eurozone debt ratio of about 475%. The US by contrast is around 325%. Canada is almost at 300%. Not surprisingly Japan is number two over 600%. Japan also has the largest government debt to GDP ratio of nearly 230%. Household debt which is constantly cited by heads of central banks including the BofC and the Federal Reserve is by comparison relatively low. ***The huge financial sector debt particularly in the UK is a potential big problem though. *** The UK’s financial debt to GDP ratio is in the area of 600%. ***The UK is the least regulated financial market of all of the G10. That probably helps explain why so much debt is domiciled in the UK. *** The UK financial centre in London is known for its financial innovation. Innovation in the financial world migrates to where the regulation is weakest. ***The question begs then what is Sweden doing that the others are not doing? At one time Sweden had a very tough banking regulatory environment. It has since been considerably weakened. *** Could this weakening of its regulatory environment eventually catch up to them as it has in Japan, Britain, the US and others? Eventually in countries like Britain, the US and Japan and even Canada the government comes to the rescue if the financial sector gets into trouble. This was especially seen in 2008 when the government’s lavished taxpayer funds on the financial institutions in order to prevent a meltdown. When the crisis ebbed the financial institutions went back to business as usual. Given the growing financial crisis in the Euro zone over Greece, Spain and others it is not surprising that the bailouts are not so much meant for those countries but instead the banks that have exposure to them. The banks are bailed out while the countries are told to accept severe austerity. Not surprisingly this has caused considerable resentment. ***The trouble now is that the western economies are barely growing if at all. As growth falters the ability to service the debt becomes more and more unmanageable. And the fiscal policies are not working either. *** The fiscal policies of austerity and tax cuts only adds to the malaise as unemployment grows, tax revenue falls and in turn this brings another round of tax cuts and austerity. Fiscal stimulus to encourage growth was tried following the 2008 financial crisis; however, it only generated at best anaemic growth. The western economies appear to be caught in a liquidity trap where adding more money is having little in the way of impact. Corporations are flush with cash but they are not spending. *** All the other tools have already been used and in the US they can’t cut interest rates any further when they are already zero. But QE is not the solution either as ultimately it leads to currency debasement and monetary inflation. In the extreme it brings hyperinflation. Some believe that is coming. *** They can roll it over and they can service it as long as the economy at least produces some small degree of growth. If you are new to this topic, you may want to click on Public Debts for Vested Interest Payments. This entry was posted in Uncategorized and tagged Debt-to-GDP ratio, Eurozone, Federal Reserve System, Gross domestic product, Morgan Stanley, Spain, Toronto, United States. Bookmark the permalink.